Creating a brand voice is a must for any company that relies on written communication. But, the actual brand voice creation process can be very time-consuming. These 8.5 tips will help you to jump-start your brand’s voice and content today. As you develop a consistent brand, you begin to take ownership of your own niche in the market. When you choose a position and then consistently reinforce your position, it becomes more difficult for competitors to come in and take that advantage away. The ability to manage your market position trains customer expectations, setting a foundation for continued success. Everyone loves a good story. They even prefer a bad story to a list of dry facts. Why are stories so powerful? The book Made to Stick, dives deep into the power of stories. It includes the example of photocopy repairman sitting around on their lunch break and telling stories. During one story, a repairman goes into great detail on the work he put into resolving a false error code. The reason he shares this story instead of saying, “watch out for this false error code”, is that the story aids in memory and comprehension. You can leverage this same power in your content. Telling the story of a client who was dealing with a frustrating situation gives your customers someone to connect with. They could even be in that same situation. Explaining how your product or service solved that paint point will help them to imagine how they could benefit from it too. 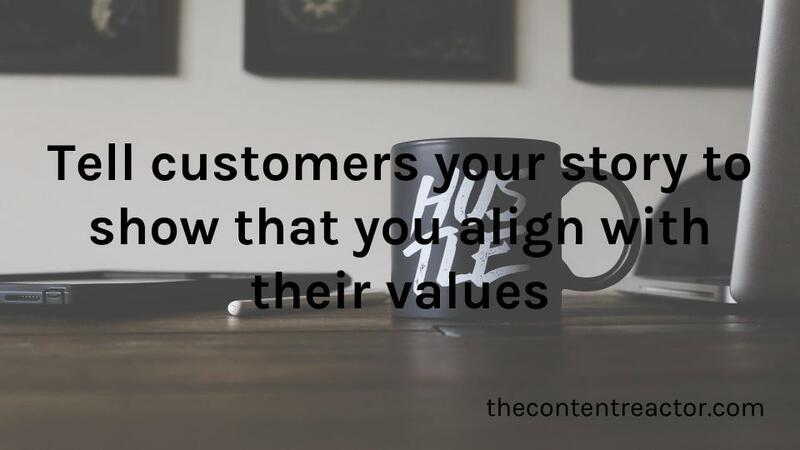 Finally, bring the story to a memorable conclusion; this will help customers to remember the entire buyer’s journey and make your ideas stick. Share the client’s situation and make sure to keep it relatable. Now, bring up the pain point. What problem are they facing and what negative impact is it having? Enter your product/solution. Explain how the client solved their problem by using it. The happy ending. What benefits are they enjoying? Call-to-action. Encourage readers who are facing a similar issue to contact you, learn more about your products, or buy. If people are interested in others’ stories than you better believe that they’re interested in your company’s story. Think of a job interview, the interviewer asks you a bunch of questions to learn your story and see if they want to be in business with you. Your customers want the exact same thing. Whether we acknowledge it or not, customers prefer working with companies that share their ideals. In fact, there’s an app called Shape that’s designed to help investors find companies that align with their own morals. The market wants this information about your company too, so give it to them. 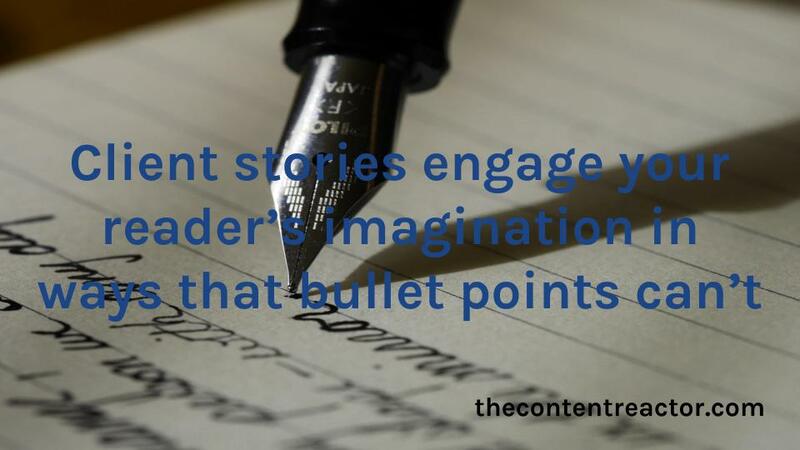 Besides these key spots, pepper your story into other pieces of content. For example, when announcing a new product say something like “we remember building our first [your product] in mom’s garage. Our goal was to help people like you to [benefit]. The [new product] was built in line with that same vision.” Doing this shows that your company has a history of caring for its customers and that it knows where it came from. This makes your company and its products more appealing to consumers. In 2009, Apple launched the genius marketing campaign lead by the catchphrase “there’s an app for that.” Yes, no matter what challenge or difficulty you were facing Apple had a solution to help you out. Something similar happens in the business world. Emails are the bread and butter of business communication, but writing effective emails is hard! And with so many people writing emails for a business, with varying styles and writing abilities, your brand’s unique voice will break down pretty quickly. But, creating email templates is a handy way to solve this problem. How should you go about this? 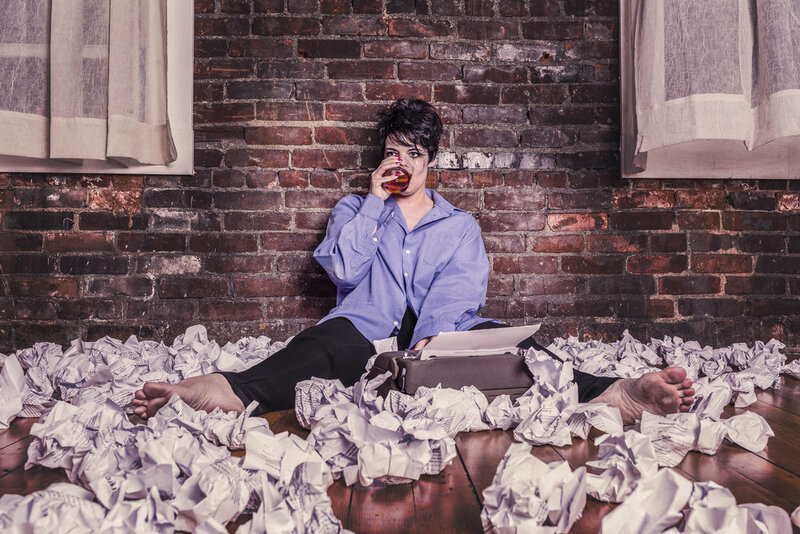 First, get someone with solid writing skills and an understanding of your brand’s voice. Have that person go around to people who regularly send emails, this will mainly be sales and customer service. Find out what types of emails they typically send and which formats give them the best results. Then create a series of templates based on common emails, employee suggestions, and your brand’s voice. Once you have a set of emails make sure to clearly mark your variables, so that they’re always filled in correctly. An easy way to do this is to put variables inside of square brackets and highlight them in an obnoxious color, like so “[Client name].” This will prevent any embarrassing mishaps. Also, think of guidelines to give employees for their follow-up emails. Having an initial template is great, but you need something in place for emails further down the line. Take steps in advance. Finally, make it easy for employees to use the templates by integrating them into your email service (for example, in Gmail you can set up canned responses, which serve as email templates). Also, explain that you’re not trying to micromanage their emails, you’re simply making sure that the company is always accurately represented and following these templates and guidelines will help them to do a better job. 5. Where’s your content taking you? You might be familiar with the Chinese proverb, “A journey of a thousand miles begins with a single step.” That whole journey is made up of millions of individual steps. Each piece of content that you create is a step in that journey, but where are all those steps taking you? 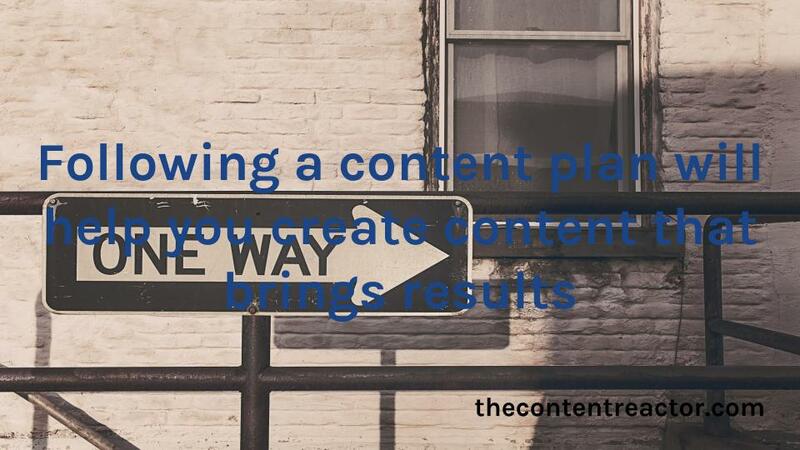 Content strategy is the process of taking strategic business goals and using content to achieve them. For example, you might want to raise awareness, get more email list subscribers, or increase your sales.These smaller goals all contribute to your company’s mission. They’re like a road map. The problem is that a lot of companies produce content inconsistently and without direction. They take a step to the right, a step to the left, a step back, and a step forward. In their minds, they’re really moving, but they’re staying in the same place. Don’t make that mistake. Research: Get to know your audience. Answer questions like: what kind of content do they want? what’s holding them back from buying from my company? what other needs do they have that my company could also take care of? how do they consume content? Once you’ve answered these questions, turn the data into buyer personas (characters who represent your ideal clients). More research: Now that you know who your audience is, you need to find out what they’re searching for online. You can use Google’s Keyword Planner to find terms that your target market searches for. Also, considering using a Google Form to survey your existing customers to see what topics they care about. Turn all these keywords and topics into a list. Set goals: Based on your research, what goals could your company achieve within the next year? If possible, create a few SMART (specific, measurable, agreed upon, realistic, time-based) goals and align the content you create with them. Create content: Based on your list, choose a main topic or series of topics to cover. Spread these out onto a content calendar, so that you move in the same direction consistently. Then trickle out the content. Promote your content: Some think that creating content is the hard part, but promoting it is the real challenge. Set up a promotion checklist in advance. For example, every time you create a new blog post your promotion checklist might be: 3 tweets, 1 email to your list, post to Facebook groups, republish on LinkedIn, syndicate on sites with a similar audience. Having a checklist ensures that each post gets the promotion that it deserves. Analyze: Every few months look at the analytical data to see if you’ve reached your SMART goals. Have you increased web traffic? 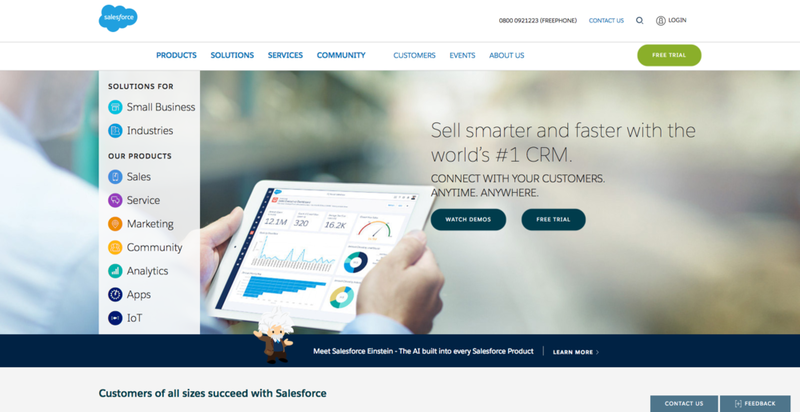 Do you have more sales? Do your clients have a better impression of your company? If you see that your content efforts haven’t moved the needle, then revise your strategy and try again. Content strategy can be complicated, but if you follow these basics steps you’re sure to gain a deeper understanding of your audience and have content that moves your business forward. If you’ve already heard this a million times, then let me say it to you one more time. 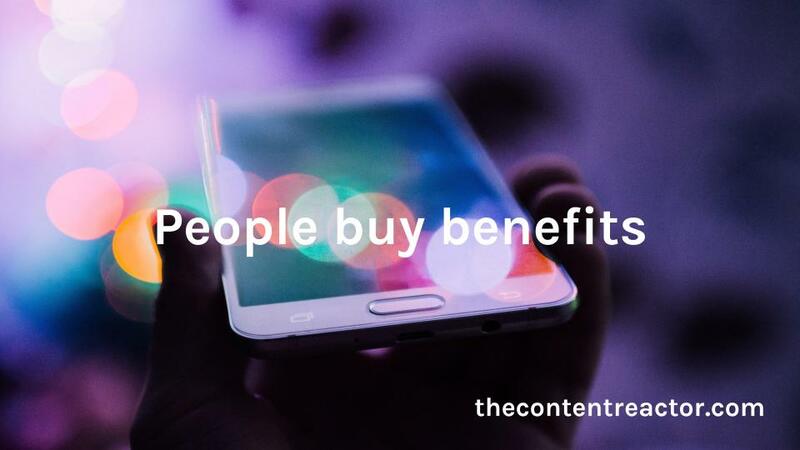 People buy benefits. They don’t buy a blanket with 300 gram wool; they buy a warm blanket. The benefit matters more than a specification ever could, because a benefit relates to emotion and not logic. Unfortunately, brands continually forget the first lesson in marketing. They focus on why their products are better instead of the benefits. This leads to the cardinal sin of content…being boring. 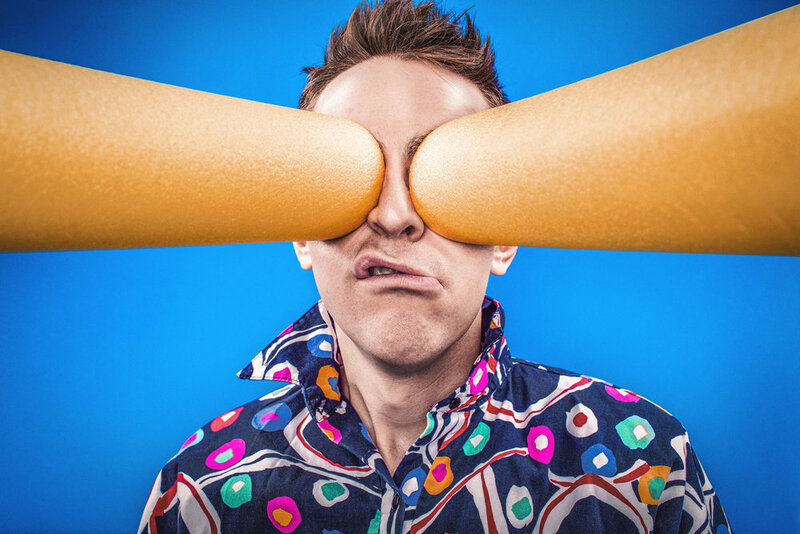 You don’t want your brand to be boring! So, what can you do? Let’s compare two pieces of copy from two made up car companies. Which one do you like more? Example 1: Feel like the king of the road while saving fuel and protecting the environment. With a clean design that eliminates waste, the X2 is the culmination of what a car should be. Get yours today. Example 2: The X3 uses a high-efficiency fuel system to increase torque while reducing consumption. This advanced efficiency is also reflected in the X3’s low emissions and reduced risk of breakdown due to carbon build up. The X3 can be purchased from your nearest dealer. Which car company are you more inclined to buy from? The X3 has features that you didn’t even know you wanted, but the content is a bit dry. The X3 may be logically better in every way, but it has zero emotional impact. However, the X2 appeals to emotion while sharing a few key facts. This style appeals to a broader audience and brings emotions into play, allowing it to blow the X3 out of the water. Get into your customer’s head and imagine what they’ll do with your product or service. What impact will it have on their life? In real-world terms, how is your company providing a better solution than the competition? 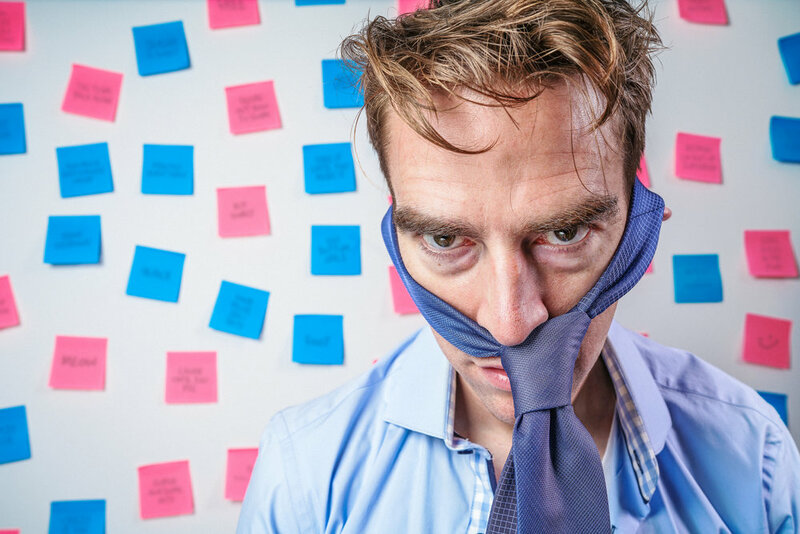 What problems can your customer avoid by using your solutions? How will using your solution impact the lives of those around your customer (for example, their family or co-workers)? 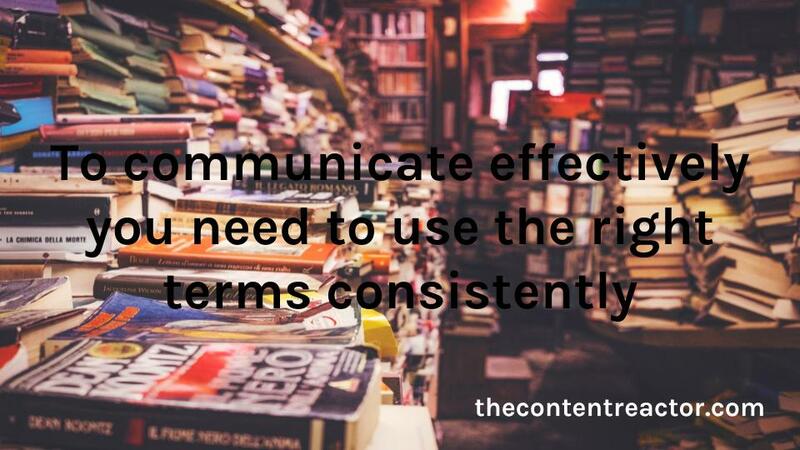 The answers to these are the benefits that you need to inject into your copy to make it appealing on an emotional level. Has this ever happened to you? You’re buying a new product and the salesperson is great. They understand you and get you excited about the product. Their great attitude makes you really trust the company. In the following months, you enjoy interesting emails and blog posts from the company. But, then the product breaks and you need to contact customer service. You get grilled about what happened to the product, they’re rude to you, and the company doesn’t fulfill its warranty. Trust broken. This is an everyday case of two-faced company syndrome. Somewhere between sales and support there’s a disconnect. This leads to clients who feel deceived and will bad mouth your company every chance they get. There’s only one way to combat this: destroy the second face. You need to be the same company through and through to maintain loyal customers and improve your brand voice. Be up front about restrictions, exceptions, and any other “negative” things the customer may encounter further down the line. This eliminates any surprises that could hurt your relationship with them. Create guidelines for Customer Service to use. 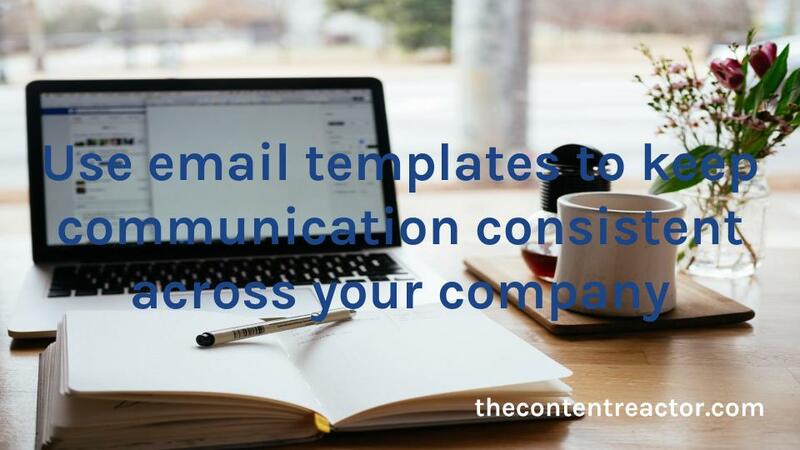 As I mentioned earlier, email templates can help with this, but you also need to give guidelines to make sure that Customer Service doesn’t break your company’s image. Give the customer an outlet for their suggestions, concerns, and complaints, and show that you listen. Just feeling heard can have a huge impact on how customers view your company. When the customer runs into an issue, offer a gift or a free bonus. Inject the negative situation with a touch of positivity, so that it doesn’t damage how they view your company. Implementing these suggestions may require doing a little bit of restructuring, but they can go a long way toward building a more loyal customer base. “Stop, collaborate, and listen.” Even though the command to “collaborate” makes absolutely no sense in the opening line of ice, ice baby, it can be valuable to us. For years, musicians have understood the power of collaborating with others. The results are exciting, interesting, and expose each musician’s music to new listeners. As a brand, you should take a page from their playlist and collaborate with businesses or industry experts. This gives you credibility and can help you expand your audience with minimal effort. Is there an industry expert with a new book out? They’d probably be eager to share their ideas with your company’s audience. 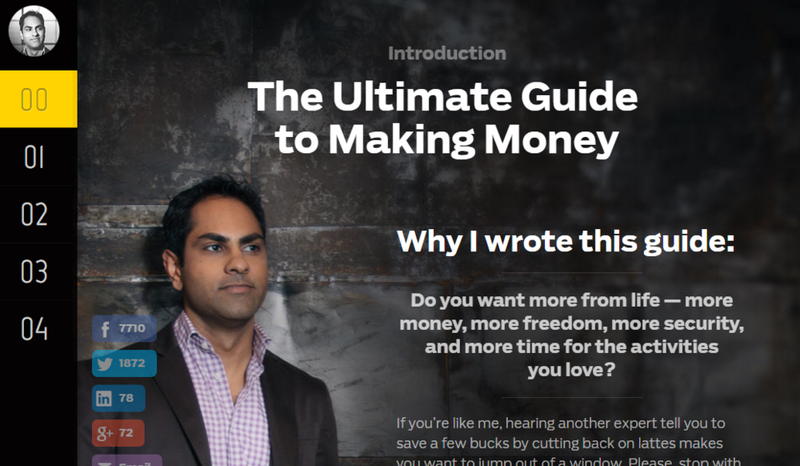 Have them do a few posts on your blog based on their book. This will give your audience interesting new content while giving the author a platform to promote their book on. Does your company have any key partnerships? Exchange articles or social media posts with your partner. This will strengthen your partnership and help your customers to better understand how you collaborate with others. Have your company create its own unique content to syndicate. Share it with industry publications to establish your expertise or publications/websites your customers read to use as a lead tool. 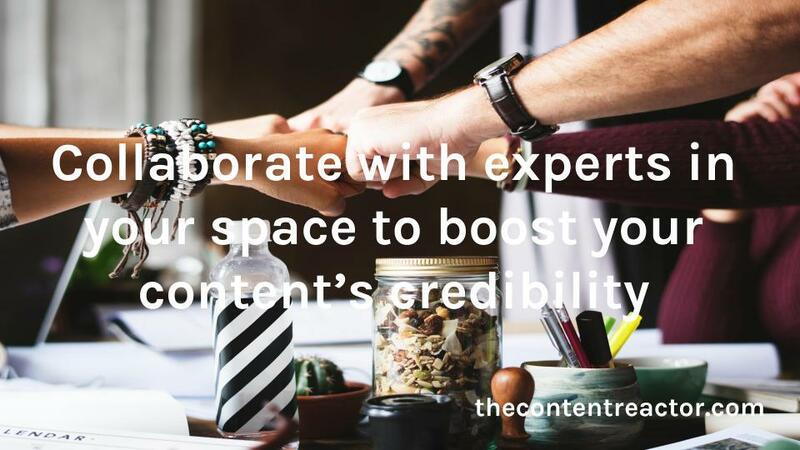 Collaborating gives tired content a jolt of creativity and excitement. This can be just what your brand needs to holds its audience’s attention. Case in point, this guide started out as 23 points. Don’t bore people or lower your brand’s perceived quality by pushing out sub-par content. 5 great pieces of content will always do better than 100 mediocre ones. Didn’t see that one coming, did you? Yes, the simplest way to improve your brand’s voice is by creating a brand voice. In fact, your brand voice guidelines can help you to apply all the above points and more. How will a brand voice benefit you? A brand voice makes your content stand out. A brand voice shows that you care about your audience’s needs. 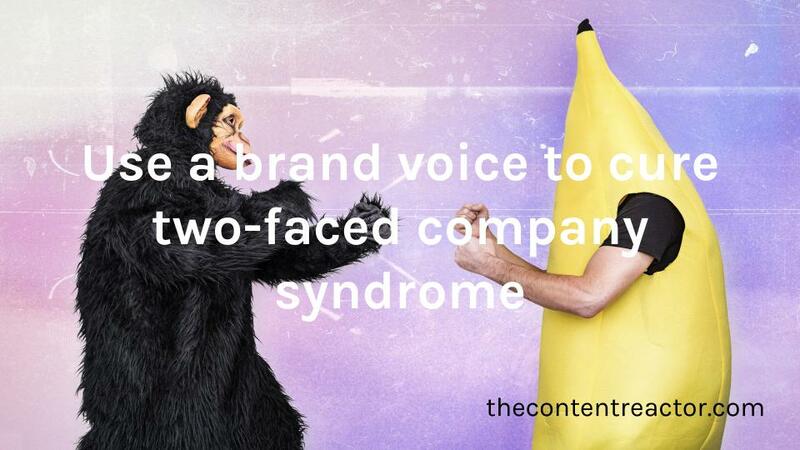 A brand voice cures two-faced company syndrome. A brand voice gives your brand a consistent personality. A brand voice simplifies your long-term content strategy. Don’t get stuck in stale, outdated marketing approaches. Join the next generation of marketers. Create a brand voice today! Do you want an expert to create your brand voice? We literally wrote the book on it. Contact us and we’ll be happy to help! Creating an app can take hundreds of hours. What may start out as a simple idea, can turn into hours of coding, testing, and reimagining. We all appreciate a well-designed app, but most of the time developers aren’t paid enough for the actual work involved. Why is that? You may have noticed that a lot of great apps are buried at the bottom of searches while poorly built apps dominate the category. This isn’t because people want low-quality apps, so what’s the deal? The problem is discovery. A lot of genuinely useful apps are hard to find or might be presented in a “sketchy” way. This will obviously reduce downloads, which leads to a lower app store ranking and even fewer downloads. That means that you could earn less than minimum wage for hundreds of hours of work. Is there any way to turn this around? The key is ASO (App Store Optimization). 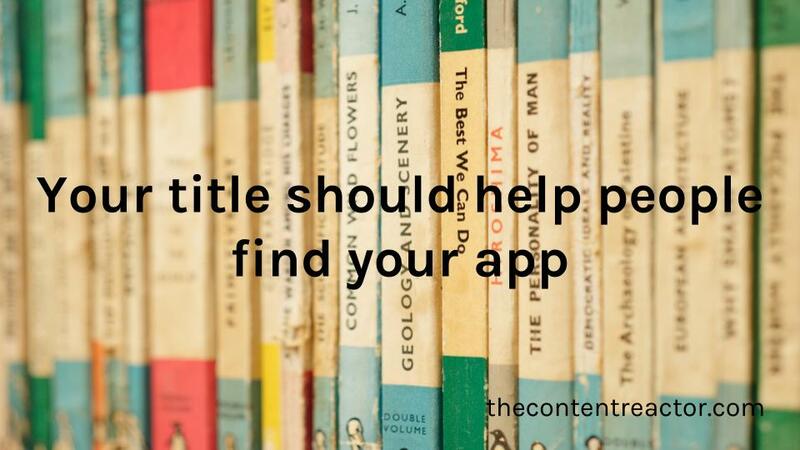 When your app’s title, description, and icon follow a few simple guidelines you can quickly turn an app with a falling ranking into a best-seller, or at the very least earn a decent wage. Let’s find out how! Unsurprisingly, the main way that users discover and download new apps is through searches on the app store (up to 63% of apps are downloaded this way). This is good news because you can do things to improve your search ranking, but it’s harder to create word-of-mouth. 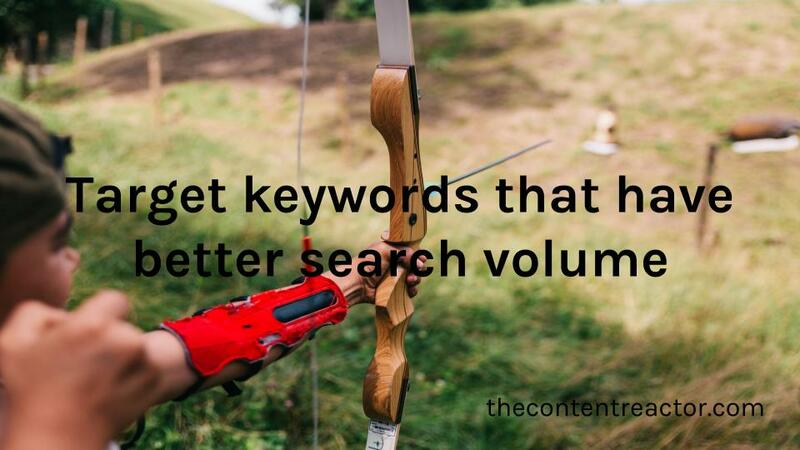 If you have any experience with search engines then you already know how important keywords are. Keywords are words or phrases that match your app description. For example, your app might teach people English grammar, in that case, related keywords might include: grammar lessons, grammar trainer, English tests, etc. The easiest way to find what keywords to use is by doing research with Google Adwords. To use this service simply sign up for an account (this is totally free, you only pay for the ads purchased). Once you have your account, go to Tools and select Keyword Planner. Then all you need to do is enter in keywords that you think would be related to your app and check the search volume. This gives you a good idea of what search terms are most common on Google, but now you need to see how they do in the app store. Try searching for the terms with the highest monthly search volume and see whether your app would fit in with the search results. Based on these tests, you might decide that instead of calling your app a “calorie tracker” you’ll use the term “calorie counter” since it has a higher search volume and still matches your app. This simple step will ensure that app appears as a result in as many relevant searches as possible. Next, you need to choose the right title for your app. You probably have a cool ultra-modern one-word title that perfectly encapsulates the essence of your app. Maybe you planned on calling your calorie counter “fi”, which is obviously short for fitness. Would this be a smart choice? Not really. You see, your app’s title is part of ASO too and not taking advantage of it to optimize your ranking is a waste. So, how can you keep your cool name while optimizing? So, what can you do with your ultra-chic name? 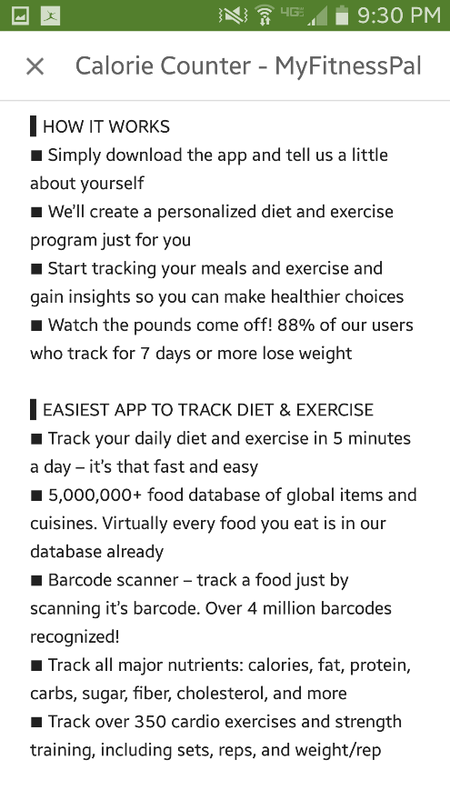 Why not try something like “Calorie Counter by fi”? By including keywords in the title you can increase your app’s downloads by 10.3%. The description’s purpose is to explain your app to potential users in just a few seconds and get them to download it. So, keep it short and snappy. Users appreciate clear, concise communication. Check that out! This is a great example of the elements we listed. If you implement this format on your app you’ll be able to quickly show it off and boost sales! Finally, you need to make sure that your app gets great reviews. Now, you may think that this is out of your control, but there you can do a lot right now to get more positive reviews. Be responsive: When your app receives a negative review, respond to it and try to resolve the issue. Listen: If you notice that a lot of reviewers would like to see a certain feature then add it in an update. This will ensure that users will stick with you instead of going to the competition. Promote quality: Your app’s perceived quality doesn’t just depend on how good your code is, its logo, description, content, reliability, versatility, and innovativeness work together to create a high-quality app. To get good reviews you need to make sure that all of these elements come together. Be accurate: The simplest way to avoid negative reviews is to accurately describe your app. Some negative reviews are simply the result of people downloading an app that was advertised as a meal planner but is actually a calorie counter. Remember that no matter how good your app is, without the right content it can still fail. The easiest way to ensure that your app succeeds is to put the above suggestions into practice or get a professional to do it for you. We offer specialized editing and writing services to help app developers like you to get more downloads and boost their income. To learn more about how we can make your app a best-seller, talk to us today. We look forward to hearing from you!